Stereotypically the locals usually having a lot of kids--because they believe more kids give you more financial opportunity, and less access to education. Most of the generations who were born before the 80’s are fulfilling the hard labor market for the textile factories surrounding, which was started to operate at the 80’s. Due to lack of education, their lands usually being sold in little pieces to new settlers anytime they need money. As the parents get older, the remaining piece of land at the end will be divided for eight to nine children, so each kid will have small piece of land to build their house among the new settlers. Hence the rising of the density, resulted in smaller living area, and bigger environmental problems. The village has changed physically and mentally, as I saw when I paid visit earlier this year. The wetland was converted into residential area, creeks have been used for untreated wastewater disposal, trees and birds are disappeared, and bunch of new settlers occupied more spaces. Once an ideally preferred environment and territory, now have less adequate physical setting as a preferable place to live. However, generations of local people who grew up in the village for decades still have the well-developed cognitive maps, positive feeling, as well as connection, both social connection to the community and to the land. In the meantime, conversation about forced eviction was getting more intense throughout the years. Local people predict eviction might happen anytime soon, and it will never be easy. One of the solution offered by the government to avoid tumultuous on the day of forced eviction is by relocating the local people to a high apartment building with thousands of people living there. Here is when the problems of The Pruitt-Igoe Housing Project replicates. 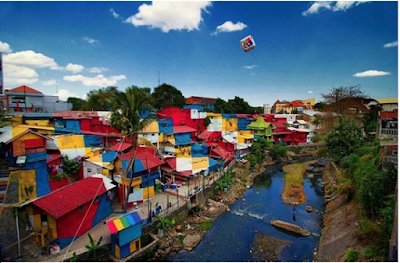 Forced eviction is a big problem in big cities throughout Indonesia, especially Jakarta. The relations between government and developer, plus lack of knowledge about social, psychological and pro-urban-poor economy system on physical removal, resulted in violence. As human is a territorial animal who are attached to a certain physical space, most of the local people refuse to be removed from their roots. Meanwhile the government never learn how to make a good urban planning to help transform a village to become an urban area without messing with the local people’s territory. Violence and human right abused have been used to overcome this situation. However, the local people usually give a good fight and government will face a hard time. Local people will fight well in their own territory the familiar place where they have control. In their territory, people also have a strong sense of community, cooperation, as well as social commitment to reach the same goal among the settlers: to remain stay in their own land. This situation creates to a lose-lose situation for the local people who become unrooted anywhere, they lost connection and territory to their land, and can’t cope with the new space. If only government help them with pre-familiarization to the new place, and change a little bit of the apartment design to give a buffer zone, it might work better. However, I believe better option for this problem is to have a better urban planning with a pro-poor urban citizen mindset, to help keeping their preferable environment and territory, while fitting with the transition from a village to urban area.